by Brother John M. Samaha, S.M. 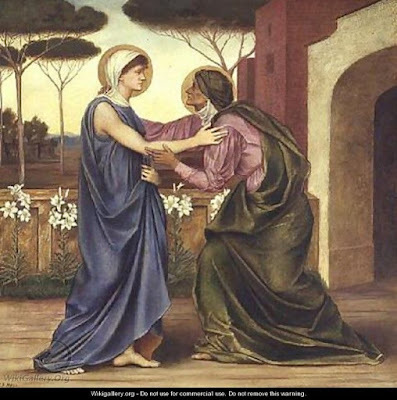 While the feast of Mary’s Visitation to Elizabeth has been celebrated on other dates, the liturgical calendar revision authorized by Pope Paul VI placed it on May 31 -- after the Annunciation (March 25) and before the Birthday of St. John the Baptist (June 24). Most likely the feast of the Visitation originated with the Franciscans in 1263. However, there is lack of certainty about the origin and the various dates that have been assigned to the feast. By the late 14th century the celebration of the feast was well established. The theme of the Visitation feast centers on Mary responding to the prompting of the Holy Spirit to set out on a mission of charity. This is reflected in the opening prayer and the prayer over the gifts, and in the canticle antiphons for Morning Prayer and Evening Prayer. With John the Baptist we recognize joyfully the presence of Christ. The feast clearly celebrates the first chapter of St. Luke’s Gospel. Church documents attest to the importance of the feast. “Moved with charity, therefore, Mary goes to the house of her kinswoman.... While every word of Elizabeth is filled with meaning, her final words would seem to have a fundamental importance: ‘And blessed is she who believed that there would be a fulfillment of what had been spoken to her from the Lord’ (Lk 1:45). These words can be linked with the title ‘full of grace’ of the angel’s greeting. Both of these texts reveal an essential Mariological content, namely, the truth about Mary who has become really present in the mystery of Christ because she ‘has believed,’ the fullness of grace announced by the angel means the gift of God himself. Mary’s faith proclaimed by Elizabeth indicated how the Virgin of Nazareth responded to this gift. The thrust of chapters one and two of Luke’s Gospel is not simply a family event between Elizabeth and Mary. The Visitation is an event of salvation history. Elizabeth, a model of the Old Testament, meets the New Testament in Mary’s faith in the mystery of her own destiny. But what is most significant is the meeting of their unborn children. John, who leaps in his mother’s womb, is already anticipating his role as precursor of the Messiah. In the Visitation narrative we look to Mary as model of the apostolate of the Church. She brings Jesus and a blessing on the house of Zechariah. The experience of the primitive Church was that the power of the Lord was the greatest gift it had to offer. To bring Jesus will always be the supreme norm of any genuine apostolate. The Church’s mission is to show Jesus as wisdom and power in each situation of human need. While the prayer after communion invites us to recognize the presence of Christ among us in the Eucharist, we must remember that the presence of Christ is discovered not only in the Eucharist. He is met in others, and he asks us to serve him in others. Mary’s service for Elizabeth by her visit remains a model for the Christian who wishes to meet Christ in daily life. Like us, Mary had to walk by faith. One writer likens faith to darkness and light. It is dark because we cannot fully grasp divine truth. It is light since faith brings us to truths we cannot know otherwise. Mary walked in the light of faith. God told her enough about his plan for her to make each new step. Faith is not only intellectual, that is, belief. Faith is also trust and action. Pope St. John Paul II in Redemptoris Mater, #14, offers an inspiring account of Mary’s faith. Faith means to say “amen” (so be it) to the word, the command, and the promises of God. An important element of Mary’s faith is also common to ours. God speaks to us through others. We come to know God and his saving plan through people in the Christian community; for example, parents, teachers, preachers, and others. Revelation is not made directly to us. Except for the special experience of the Annunciation, Mary came to know God’s will through others. Mary’s faith, which is praised by Elizabeth, draws her to the dignity of being the Mother of Jesus and still greater to being a true disciple of the Lord. Faith was not easier for her than for us. The contrary is true. For Mary it was more difficult to believe than for the apostles. She understood more of God’s plan. Pope St. John Paul II commented that the expression, “blessed is she who believed,” is a key unlocking the innermost reality of Mary. Being aware that this faith was difficult, involving deep struggle, gives us an insight into Mary’s life and evidence of her likeness to us, sharing completely in the human condition, but without sin.